Cholesterol is a waxy, fat-like substance that occurs naturally in all parts of the body and is made by the liver. Cholesterol also is present in foods we eat. People need cholesterol for the body to function normally. Cholesterol is present in the cell walls or membranes everywhere in the body, including the brain, nerves, muscles, skin, liver, intestines, and heart. What Is the concern of Cholesterol? Too much cholesterol in your body means that you have an increased risk of getting cardiovascular diseases such as heart disease. If you have too much cholesterol in your body, the cholesterol can build up on the walls of the arteries that carry blood to your heart. This buildup, which occurs over time, causes less blood and oxygen to get to your heart. This can cause chest pain and heart attacks. HDL (high density lipoprotein) cholesterol is known as good cholesterol. HDL takes the bad cholesterol out of your blood and keeps it from building up in your arteries. LDL (low density lipoprotein) cholesterol is known as bad cholesterol because it can build up on the walls of your arteries and increase your chances of getting cardiovascular disease. When being tested for high cholesterol, you want a high HDL number and a low LDL number. We all know that when we can avoid fast food, it is the wisest move for our bodies. Let us see what these foods can do to your body, and if you know the "FACTS", you wouldn't eat them even if you were paid to. The root of excess weight is an imbalance by malfunctioning of the spleen and liver organ systems. Each treatment is customized to the needs of the individual patient. Acupuncture points on the body are chosen for overall well being with the objective of increasing circulation of the blood and Qi (stimulating the metabolism) and calming the nervous system. Treatments can include a combination of auricular (ear) and body acupuncture, ear tacks or pellets to leave on between treatments, herbs and supplements, abdominal massage, breathing exercises, and food and lifestyle recommendations. An all natural healthy beverage to boost metabolism and curb appetite. Excellent to drink daily for a slimmer body! 1 Cup a Day, Easy and Effective! Cold laser targets fat cells and opens pores of the fat cell wall to release fat content into lymphatic system, the same procedure as in exercise. Some of the fatty material are used as energy source and some are flushed out of body through urine. The fat cells become deflated in essence. Think of it as going from grapes to raisins! Cold Laser treatment is a course of 8 Treatment sessions where you can achieve an average reduction of 1-2 dress sizes, or a 10-12% reduction in circumference at the target area of treatment. Response depends on pre-existing conditions, diet, exercise and lifestyle. Our Acupuncture Detoxification may be helpful! We supplement this cold laser technology with 10 minutes of Whole Body Vibration Therapy for greater fat loss. Here’s how it works: the body’s large muscle groups utilize sugars for energy, but the fast-twitch muscles of the body receive their energy from body fat. Whole Body Vibration Therapy engages these fast-twitch muscles to stimulate fat loss and increases muscle mass. 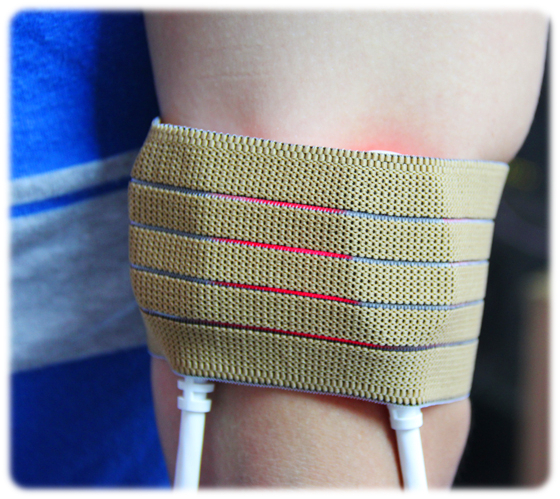 Whole Body Vibration Therapy is both safe and effective. By simply standing on a vibration machine clients can trim away inches while building up both muscle and bone density. 10 minutes of Whole Body Vibration therapy has been shown to be as effective as 50 minutes at the gym. Little wonder why more and more superstars and pro athletes are using vibration therapy as part of their conditioning. Whole Body Vibration Therapy is non-invasive and non-surgical way to lose pounds and inches. 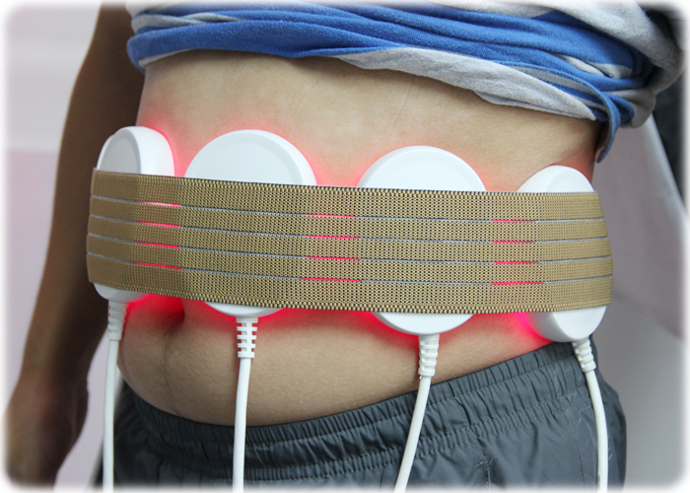 Vibration Therapy also improves circulation, digestion, and helps to drain the body’s lymphatic system. 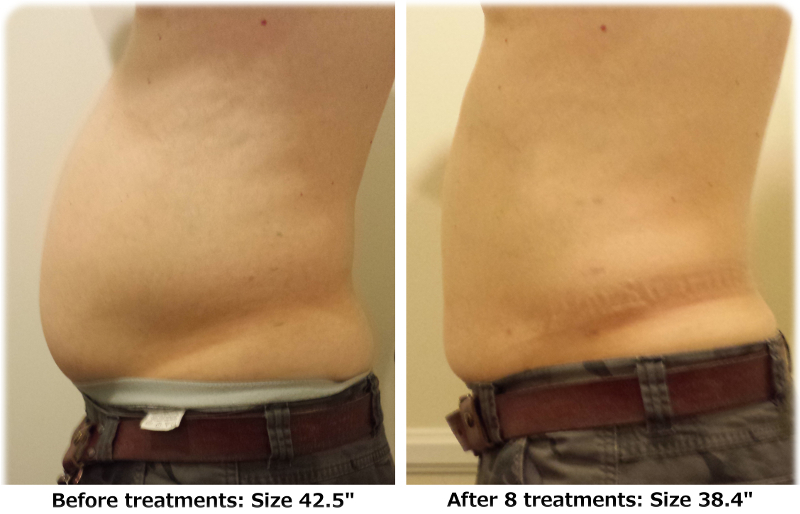 To get started on a fat-loss program of cold laser and vibration treatments set up an appointment today. Will the inches stay off after treatment? A session ranges from 45 min to 1 hour. 8 sessions (2 treatments per week) are recommended for optimal results. Initial body composition analysis, nutritional consultation, lifestyle coaching. Can I do more than one area at a time? It’s not recommended to treat more than one area per visit because it’s difficult for the body to metabolize too much fat at one time. Target areas are: Abdomen, Thighs, Arms, Chin and Buttock. Cold Laser Therapy (LLLT) will reduce inches in the target area treated. It is not a weight loss therapy. Fat is not dense so that a small weight takes up a great deal of room. This translates into loss of inches and results in limited loss of weight. Many of our clients do lose weight but it is difficult to assess as some people build muscle during a treatment course due to improved diet, exercise and lifestyle. Muscle is denser than fat so weight may actually increase or remain the same with an accompanying reduction in circumference and dress size. This would be a healthy and desired outcome. Anyone incapable or unwilling to perform exercise within 3 hours of the Cold Laser treatment should not have the procedure. The ideal Cold Laser treatment candidates are those who have decided to exercise regularly, have an ideal diet and desires targeted fat/inch loss from stubborn areas. Alternatively the treatments can act as a motivator as you begin to see improvement, which will encourage improved habits and lifestyle. Natural, Easy and Effective Weight Loss Program! It’s easy and effective. No getting hungry, no vigorous exercise necessary. People who want to get slim and healthy but too busy to exercise or worry about a diet menu. People who can’t control their appetite and has difficulty in changing their lifestyle. Weight Loss Acupuncture addresses any digestive difficulties or other underlying causes as to why the person is gaining weight. Specific points on the body and in the ear make it easier to deal with stress and hunger that can trigger overeating and binging on fattening foods. Also acupuncture can help rebalance the organ systems to boost the slow metabolism. Each treatment is customized to the needs of the individual patient. Acupuncture points on the body are chosen for overall well being with the objective of increasing circulation of the blood and Qi (stimulating the metabolism) and calming the nervous system. Treatments can include a combination of auricular (ear) and body acupuncture, ear tacks or pellets to leave on between treatments, herbs and supplements, abdominal massage, breathing exercises, and food and lifestyle recommendations. Before you begin any kind of a weight-loss program, you need to first determine if you are overweight. The quickest and most economical way to screen your weight is by finding out what your body mass index (BMI) is. What is BMI? BMI is a calculated number based on a person's weight and height. It provides a fairly reliable measurement of body fatness for most people and is used to screen for weight categories that may lead to health problems. We have provided a simple BMI Calculator page for you to get a quick snapshot of your category. If you like to have a complete BMI table, and download it to be your handy reference, please check out "BMI Table" tag, however, it is only available in standard(english) measurement. Click this link BMI Calculator page to calculate your BMI number. For people who are obese (BMI of 30 and above) and have two or more risk conditions, it is recommended that you lose weight. The good news is even a small weight loss (between 5 and 10 percent of your current weight) will help lower your risk of developing those diseases. Underweight A BMI below 18.49 is considered "underweight". However, if index is lower than 16 would be too thin and you should have your healthcare provider evaluate your condition. Normal A BMI etween 18.5 and 24.99 is considered a healthy weight. Maintaining a healthy weight may reduce the risk of chronic diseases associated with overweight and obesity. Overweight A BMI between 25 and 29.99 is considered overweight. People who are overweight or obese are at higher risk for chronic conditions such as high blood pressure, diabetes, and high cholesterol. Obese A BMI between 30 and 39.99 is considered obese. People who are overweight or obese are at higher risk for chronic conditions such as high blood pressure, diabetes, and high cholesterol. Extremely Obese A BMI of above 40 is considered extremely obese. Extremely obese people are in danger of developing cardiovascular disease, diabetes and other chronic diseases. © 2013 Dr Joanna Lin. All Rights Reserved.